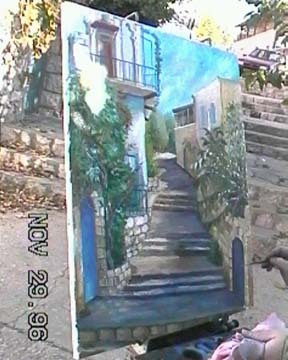 A Painting of Our Alley in Tzfat. Our Gate is on the Left. 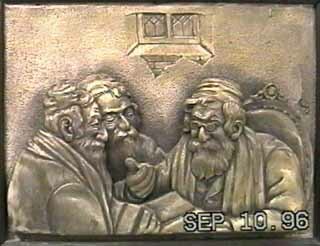 Copper Artwork Hanging in a Small Hotel on King George Street in Yerushalayim. The gentleman on the right reminds Chayim of his father (the "spitting image"). Originally a music major in College, Chayim composed and directed this quartet for flute, clarinet, violin, and cello in 1973, when he was 18 years old. Click to hear sound clip (542 KB, might take about 2 minutes' download with a 56K bps modem). 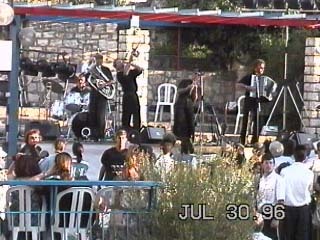 Chayim played trumpet in this combo consisting of trumpet, clarinet, trombone, string bass and drums, which he got together for a roast in 1974, at the age of 20. He transcribed/arranged the music, the Beatles song "When I'm 64." Click to hear sound clip (358 KB, might take about 1 minute to download with a 56K bps modem).